More goofing around on the boardwalk. 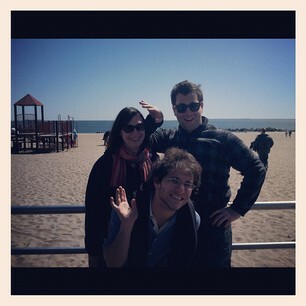 I really think that going with such an amazing group of people made our trip to Coney Island so beautiful. People who will go back to Nathan’s all afternoon, be content just sitting on the beach, and of course friends who will ride the Wonder Wheel, even the swinging cart. Riding The Cyclone was what I have been waiting for since I rode it last year! 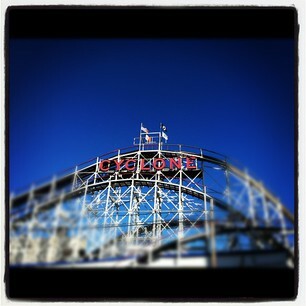 A national historic landmark, The Cyclone is a bone-rattling wooden roller coaster. It has plenty of hills and gathers enough speed to impress any roller coaster enthusiast. Most of our party sat it out. We spend more time wandering around the midway area. All of us went on the bumper cars, which was a blast. Late afternoon, we took a break from all of the excitement and went to sit on the beach. My roommate Jesse got fried frog legs from Nathan’s (pictured below). I did try them, but cannot really say that I am a fan. What bothered me most was the fact that they really look like frog legs. I generally like my meat to look as far apart from the animal it originally was as possible. There were also large black veins and bones in the legs. 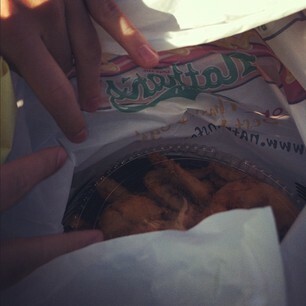 But they basically had the texture of chicken and the taste of seafood…I would say like catfish. Before the sun went down, I was back on the train for North Brooklyn. Watching the sun start to set over Brooklyn from the elevated F train, I felt sleepy but content. It was another perfect day in New York. What about Steve & Ann doing Coney Island? It can be an adventure!!! !